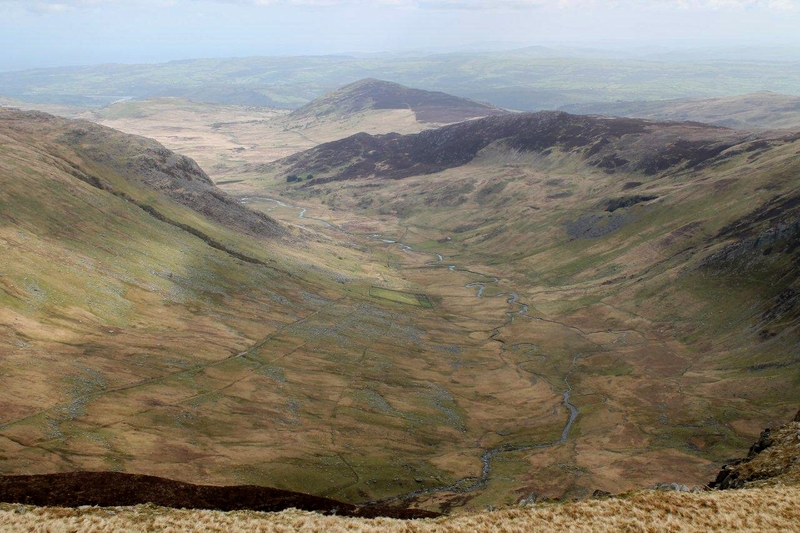 I’m not too familiar with the mountains of Wales, and to tell you the truth I’ve always been reluctant to commit myself to spending time in its hills. But I’m being won over. 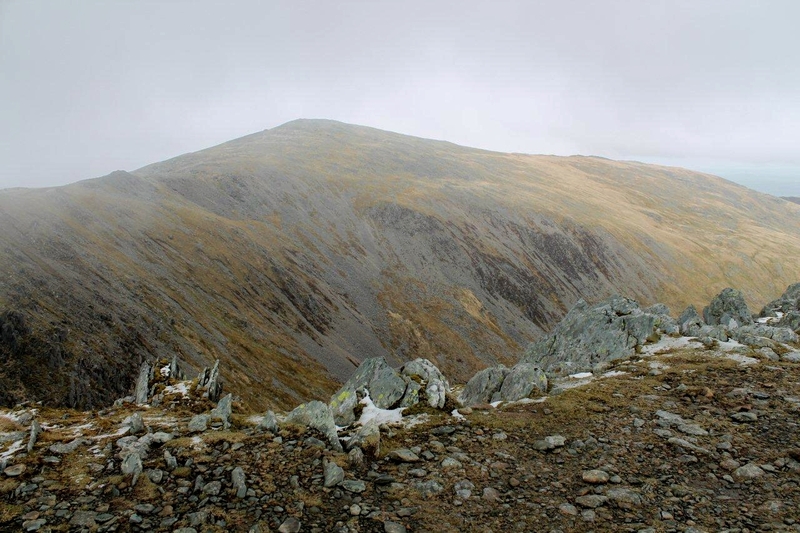 The summit of Carnedd Llewelyn is bleak, stony, and icy cold. 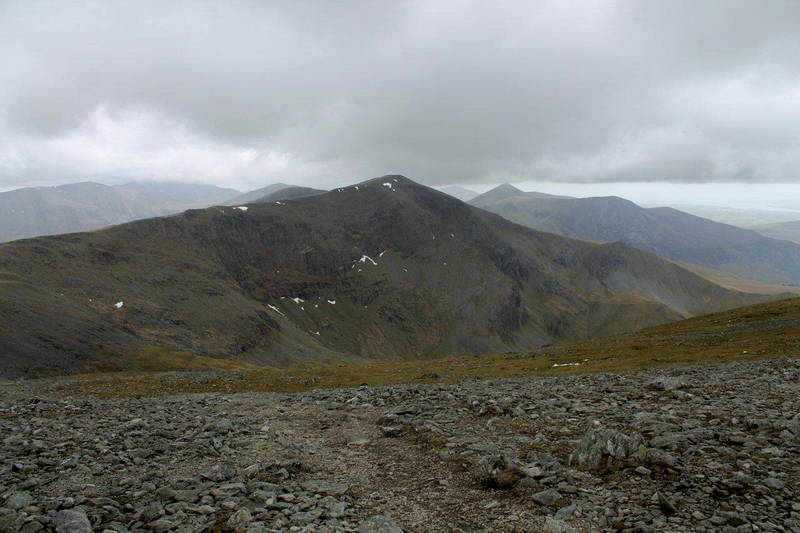 Clouds are gathering on the Glyders to the south as I continue my walk towards Llewelyn’s brother peak, Carnedd Dafydd (1,044m, 3,425ft), (two shots below from different angles), along a splendid ridge that tumbles in gaunt crags on its northern flank. This is impressive country. 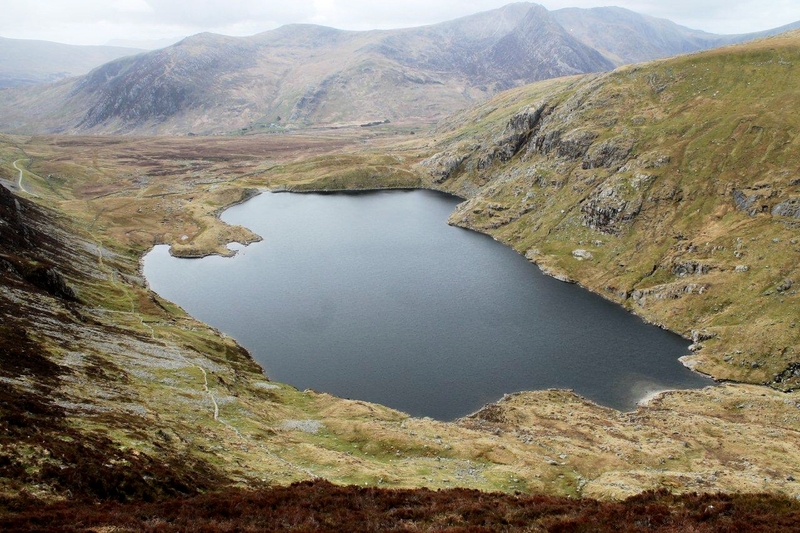 This is Wales at its wildest, showing its teeth and its broken bones. 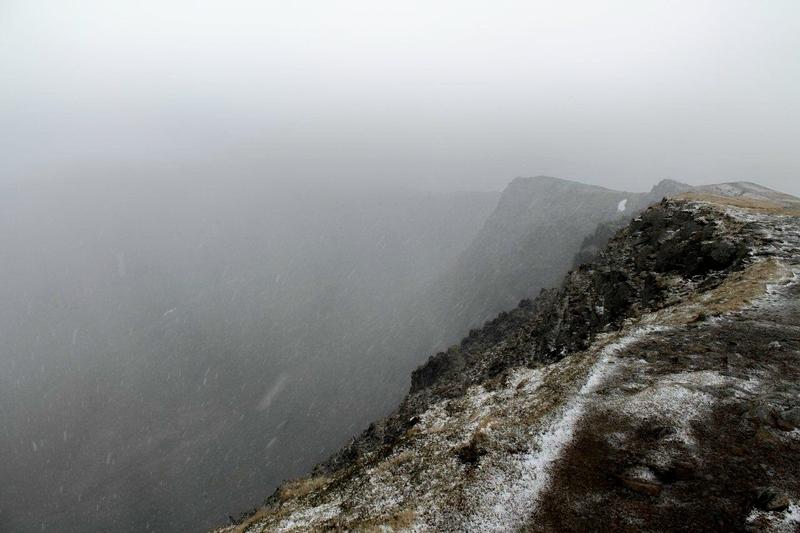 Before I reach Carnedd Dafydd a blizzard streams in to engulf the visible world. Hard snow or soft hail – I can’t decide which. It bounces off my waterproofs like tiny polystyrene pellets. The Inuit probably have several names for it – or is that an urban myth? In a rough stone shelter on the summit of Carnedd Dafydd I chat to a bloke who was caught in a similar blizzard yesterday on the Glyders. Didn’t see a thing all day, apparently, except his boots and the ground beneath them. Today the clouds sweep around the Glyders in great, grey folds, momentarily revealing stark walls of rock before swallowing them again. Glyders. I feel like I’m name-dropping. I’ve read dozens of books and articles about them, but I’ve never actually seen the Glyders until today. They are impressive hills. In snow and mist I complete the horseshoe of ridges to Pen yr Ole Wen (978m, 3,208ft) and embark on what is probably the steepest mountain descent in the British Isles – short of leaping off the Old Man of Hoy into the sea. It’s hard on the knees, and the seat of my trousers takes a battering, but the scenery makes every bruise, creak, scratch, grind and grimace worthwhile. And that’s all. Peaceful thoughts as wind whips and hail falls. Wonderment as vast rock faces slip in and out of clouds. New country. 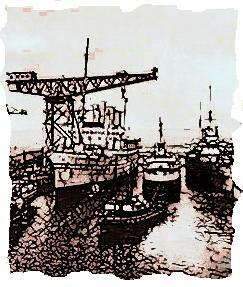 Unsettled elements. Tired muscles. Sometimes it’s enough just to climb a mountain. 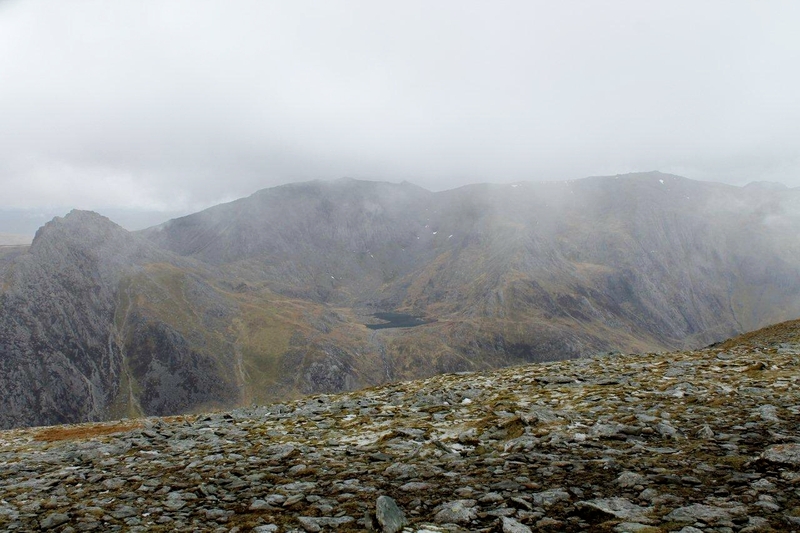 This entry was posted in Camping, Climbing, Environment, Hiking, Mountains, Walking and tagged outdoors, Snowdonia, Wales. Bookmark the permalink. Some great photos there Alen. 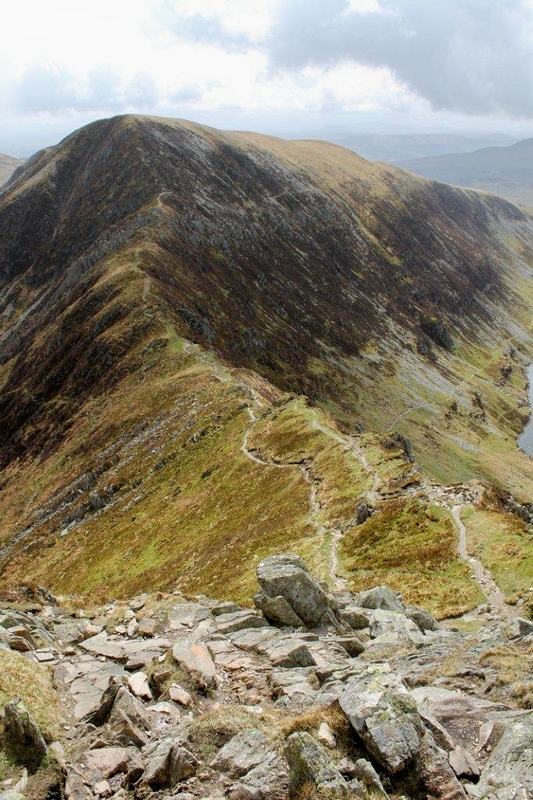 I have walked very little in Wales, because it is quicker for me to go to the Lakes or even the Scottish Borders than Snowdonia. However I am sure I am missing out on some great hills there! Hi there Mark. That’s exactly how I’ve felt about the place all these years. Plus I had this impression it would be crowded with walkers and highly commercialised like the Lakes – but I was pleasantly surprised to discover it isn’t. I shall be returning. 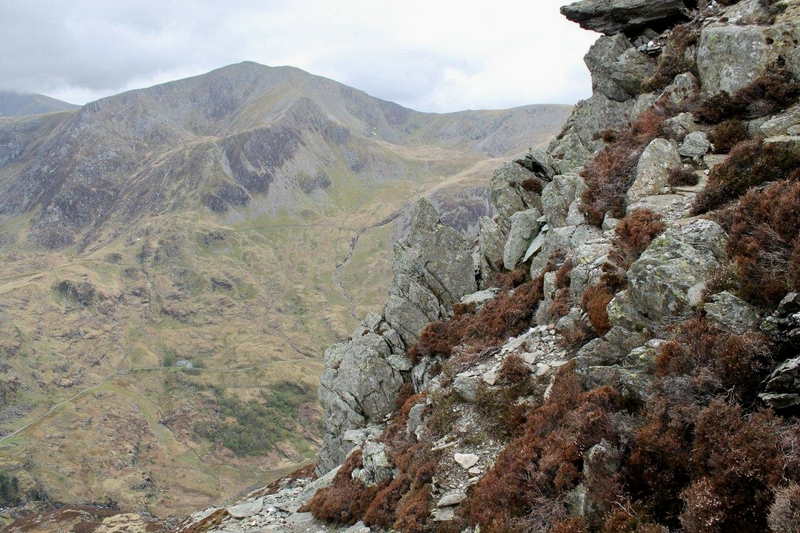 Hi Alen enjoyed your post,just got back from walking around and to the top of Snowdon so a very timely post,thanks. Hi John. I hope you had better weather than I did. Snowdon was on my list but I decided to save it for another time. 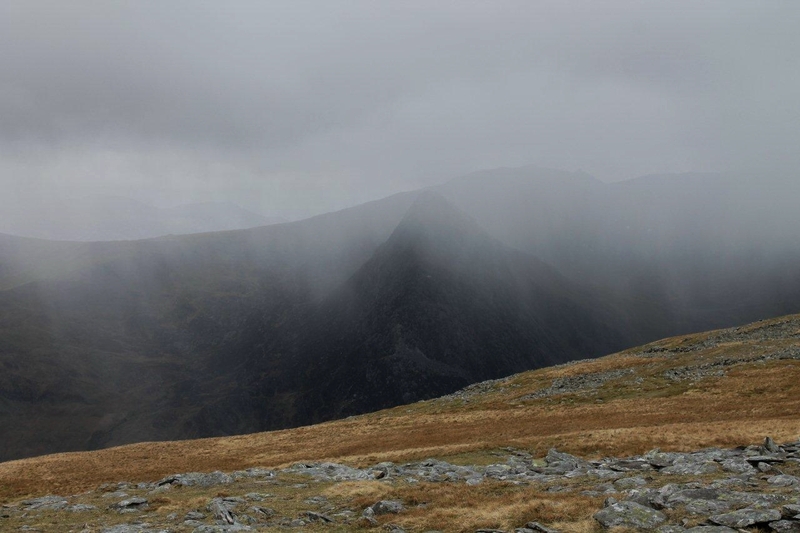 The Carnedd Llewelyn day was the best I had. That’s great – I hope your son enjoyed himself. I used to take mine with me, but when he got to about 15 he went into an awkward period and never came again. But he still remembers the names of the mountains, so something rubbed off on him. Now I’ve got big hopes for my granddaughter. She’s only three but she wants to go camping. One step at a time! Great pics and it brings back more memories! A shame the weather closed in. That is a VERY sheer drop on the way down – did you really take that route? You say it was hard on the knees so I’m guessing you did! Eeeek! Hi Jo. I just followed the path and it sort of went right over the edge. 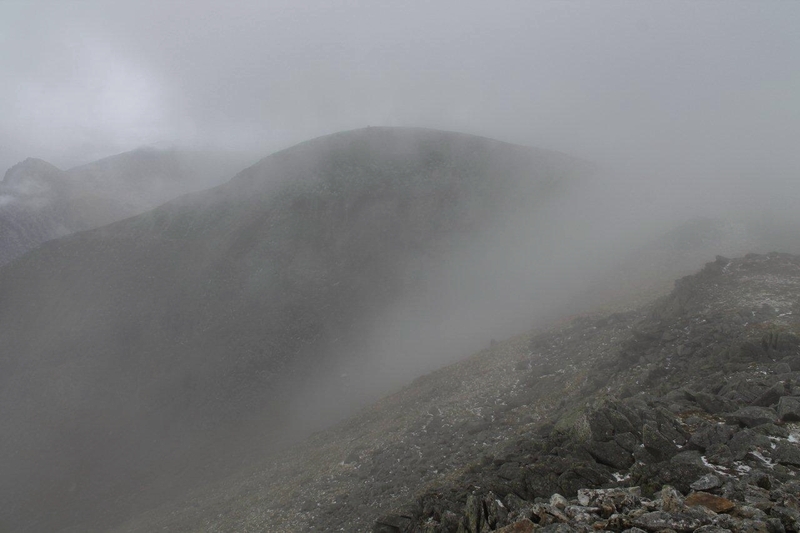 The chap I talked to on Carnedd Dafydd came up that way and he said it was a hell of a slog. He wasn’t wrong. I am just catching up with your blog having spent the last 2 weeks in France in the pouring rain and you have cheered me up no end after reading your last 3 Wales posts. Like you I find it takes a lot more effort to visit due to the distance. That said whenever I do get there I usually enjoy some great mountain days. You don’t have to go far to find a little solitude and adventure either. That decent would have had my knees, back and everything else complaining thats for sure. Deary me. Rain in France. I hope it wasn’t to bad, David, and you managed to get out on the hills – and perhaps drink the odd bottle of wine or two. I was surprised by how quiet it was on the hills in Wales. Hardly anyone about. And for several night, my tent was the only one on the campsite behind the Swallow Falls Inn – which at £7 a night for me and the car, and good beer, I can thoroughly recommend. And like you say, there is plenty of adventure. Hope you’ve got gear dried out. Always feel like i should go back to wales but your pictures tell it all. Grey clouds and rain. Been up Snowdon 3 times never seen a thing. Mind those Glyders look good. 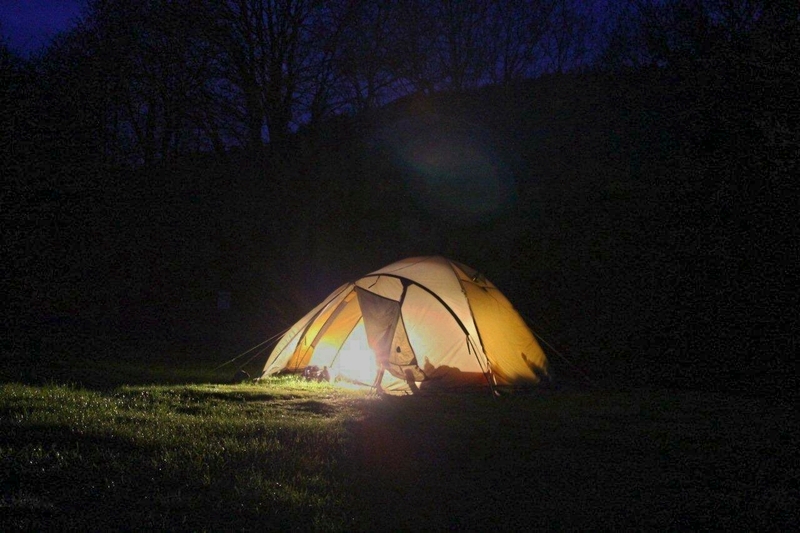 Nice shot of the tent in the dark Alen. Hi Greg. I can’t argue with the grey cloud and rain thing. That’s what it was mostly. 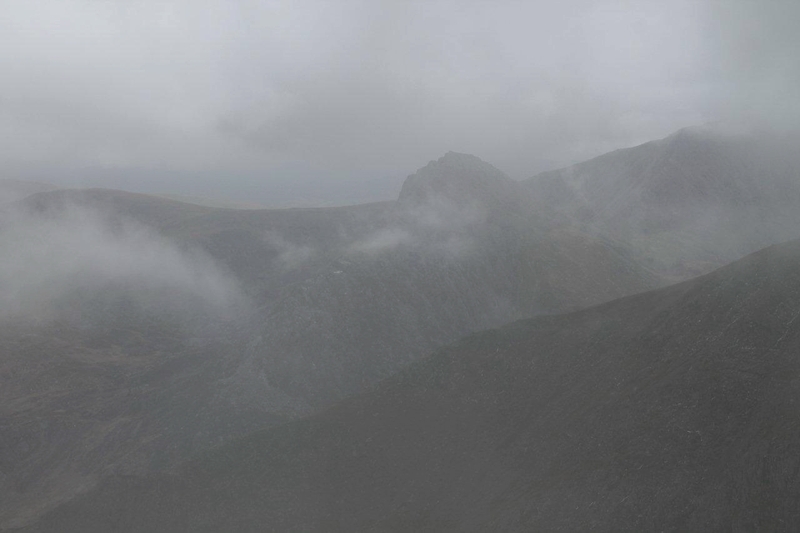 The Glyders are fantastic – they were on my list too but I didn’t get round to them. My old tent looks really cosy in that shot. The lighting comes from my equally old Coleman dual fuel lantern, which throws out stacks of heat and light and really cheers up a cold, dark night. “Sometimes it’s enough just to climb a mountain”. I couldn’t agree more. There’s nowt better than standing on the top of a hill and seeing the whole world laid out before you. I particularly like it when it’s blowing a gale too (wierd). I love what I’ve seen of Wales so far, and I’m looking forward to more of your ramblings about the area. Hiya Tracey. Thanks very much for that. There’s nowt like a nice comment to cheer up a bloke when he’s stuck at work on a night. 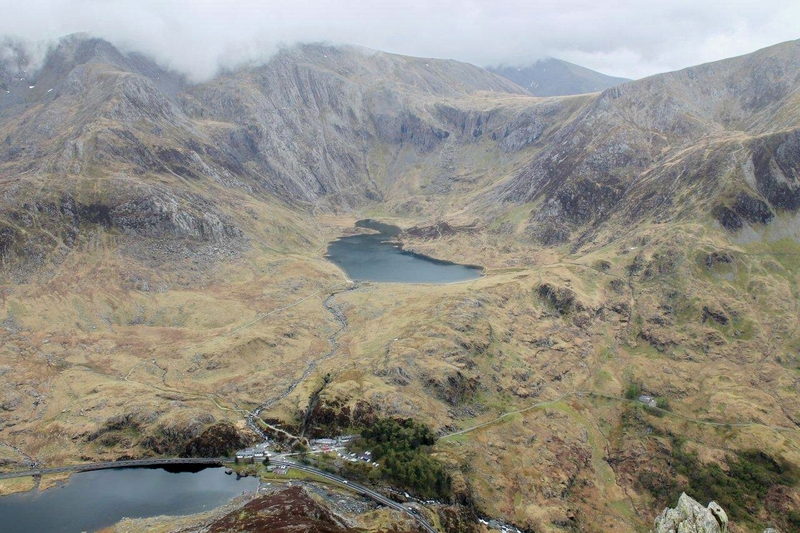 You’ve got a cracking shot of Tryfan across Llyn Ogwen half way through your photos! 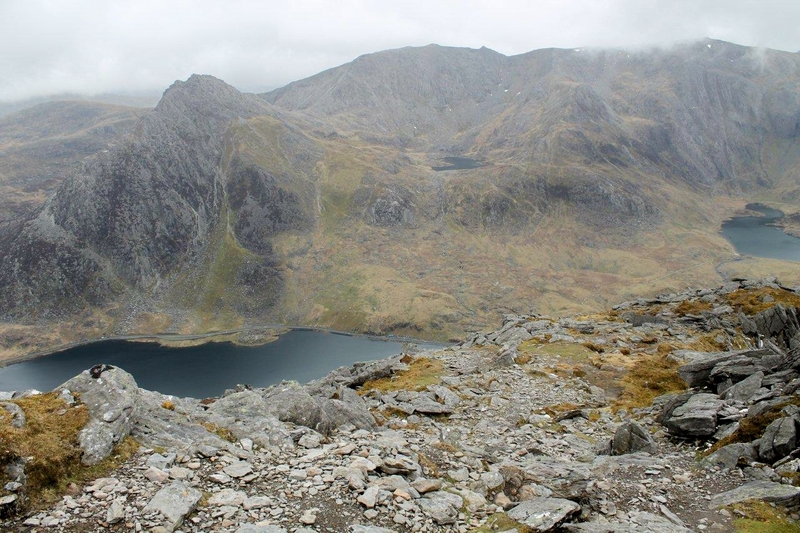 Also love the photo between Pen Yr Helgi Du and Carnedd Llewellyn. That is an awkward ridge onto Pen yr Helgi Du (or off it in your case) – I’ve only been up it and, at the top, thought to myself I’d hate to have to go down it – but there’s a raking/slanting bypass path sets off from the side arm of the mountain (probably ‘Ty Braich’ which comes out on the col above the reservoir under those awkward craggy bits – you must have missed that. 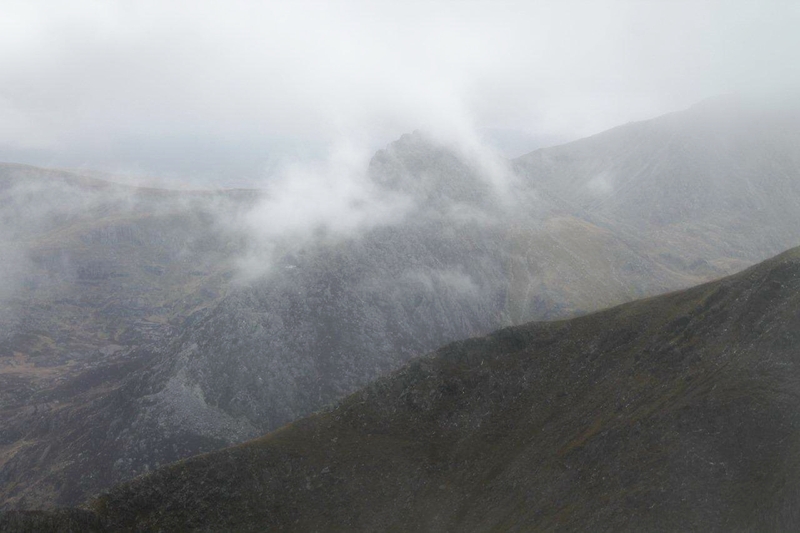 I found the crag (Craig Ys Gafn I think) up onto Carnedd Llewellyn much easier although it did look like it was going to be nasty. Hi Carol. Yes that is an awkward step and I wasn’t expecting it. 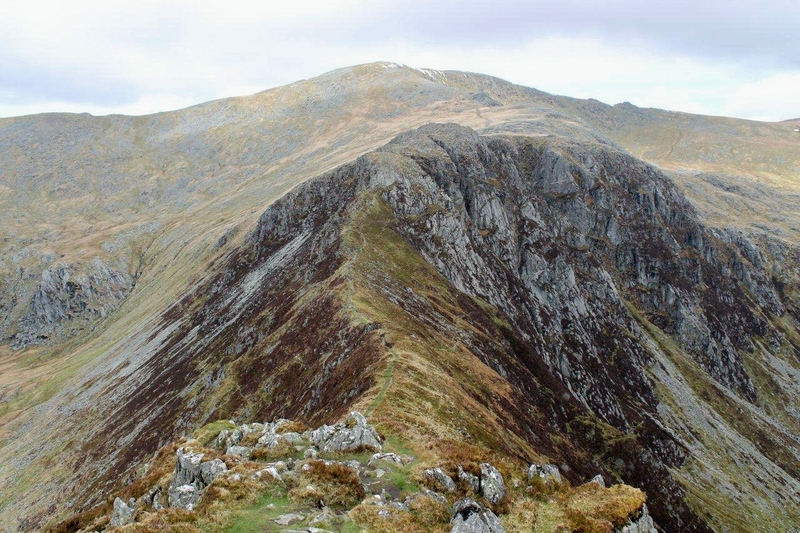 The climb up the craggy bits is a doddle, but it doesn’t look good from a distance. And yes, I missed the path that rakes across to the coll. You can see it on the upright picture. I bought a guidebook in Capel Curig on the drive back to the camp site and it describes the raking path in detail. Yes, this was last week. had a great but a very wet time. And there was me thinking that all the country was basking in nice weather last week – not so eh! Not last week. Last week. If it’s Wednesday now and the start of this week is last Wednesday, then last week starts the Wednesday before. That’s my understanding of time anyway. I’m not saying I’m right. It’s snowing here in Darlington. Just kidding. It’s okay as towns go. The station’s impressive. I did actually visit once about 10 years ago to see a talk by my hero Benedict Allen (the explorer). Hi Howellsey. I was very impressed with the Glyders. 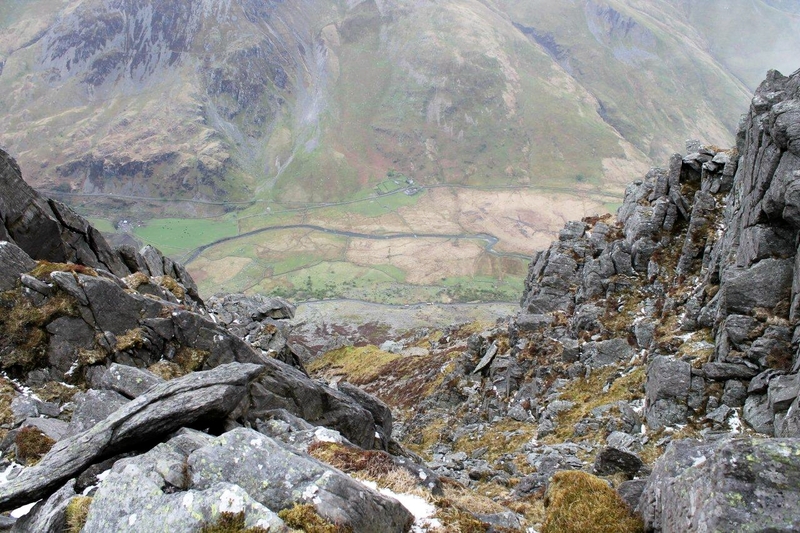 And I spent some time gazing up at Tryfan working out the best route up. Next time perhaps. I can see what you mean about Pen Yr Ole Wen. The start of the path next to the river is just a wall of rock. I sat scratching my head a minute or two working out how to get down it, so if I’d been going the other way I think I’d have given up there and then. The decent is incredibly steep, but there’s very little hands-on scrambling. I’m away over to Wales next week so I might have a think about giving this route a crack, especially if the weather remains so clement! Good luck. Wish I was down there in this weather. Thank you, Mrs Potter. You are so kind. 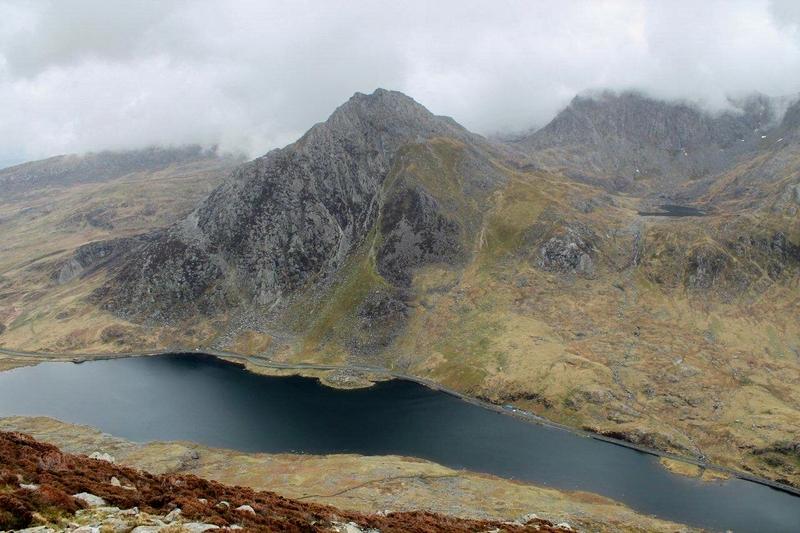 Cracking photos of Tryfan you have there ! I would put it in my top ten of British Hills. 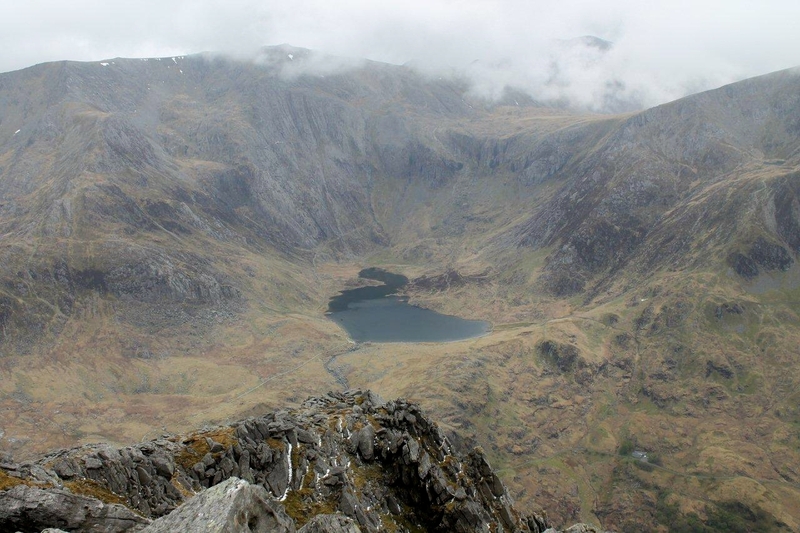 We spent 3 or 4 days down in North Wales every year and it never disappointed but I haven`t been back for a while now.Other than Snowdon and Cwm Idwal I don`t remember it being overly busy. Hi Alex. 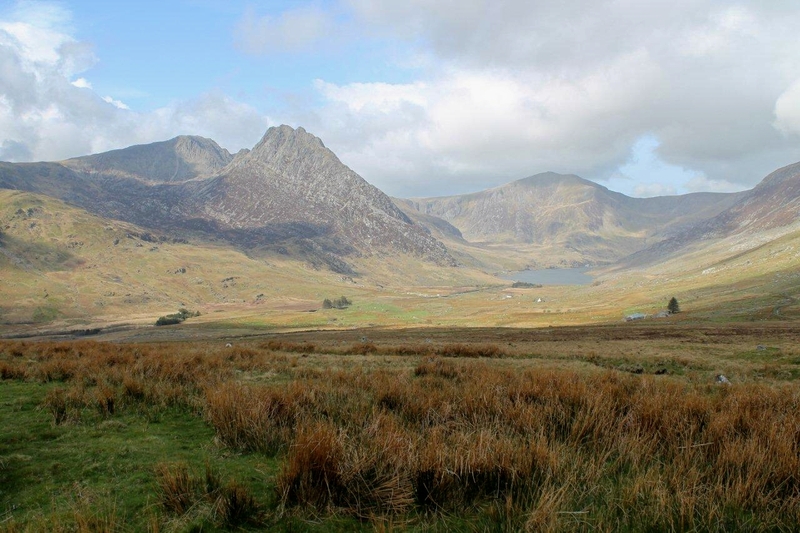 Tryfan is a fantastic mountain and I can’t wait to climb it. According to my guide there are a couple of scrambling routes up the front but I think I’ll take a less formidable route. Your tent looks very cosy and I’m glad you like the mountains of Wales, Alen. But sometimes I wish I could transfer you to some lush and green mountains with wild rivers with a single or two glaciers here and there and of course with a beautiful blue sky. It just so happens, Hanna, that I’m off to some lush green mountains in the very near future. There might well be wild rivers as well, but I’m pretty sure there won’t be any glaciers, unfortunately. Having said that, I’ve climbed glaciers in Iceland, but that was long before blogs and digital cameras were invented.